What Relief Is There for Neck Headaches? The medical term for a neck headache is a cervicogenic headache, a type of secondary headache caused by issues in the neck instead of the head. 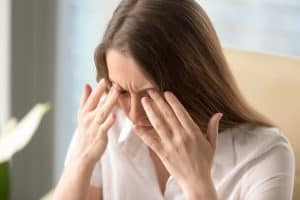 Twenty-four percent of all headache cases brought to doctors’ attention are secondary type headaches, according to researchers. Thankfully these headaches can be resolved by correcting the problem that is causing them. Neck headaches can originate from various parts of neurovascular or musculoskeletal structures in your upper neck – within the upper three vertebrae (the C1, C2, and C3), neck muscles, and spinal cord coverings. When there is a problem in this area, it sends pain signals through the trigeminocervical nucleus in the brainstem. These messages are received by your brain via your brainstem and from there they are interpreted as a headache. When neck joints are too stiff, move too frequently, or are stuck in an abnormal position, it can lead to a neck headache, or even in some cases, facial pain. Pain can sometimes begin in the neck when your neck muscles or shoulder blades are overworked, spasming, or knotted. The reason these muscles may become overworked is from protecting injured neck joints. In other cases, certain muscles in the neck can become weak from lack of use, putting a higher demand on the other muscles and causing fatigue-related symptoms. In order for the neck muscles to function optimally, they should have normal resting tension. Bony growths from arthritis, disc bulges, or swelling can lead to pinched or irritated neck nerves. The pain messages get sent along the nerve pathways and can cause headaches. One way to think about it is as if your neck is the switch and your nerves are the electrical wires. When the wires light up is when the headache happens. What Symptoms Are Associated with Neck Headaches? One simple way to help with a neck headache is to be intentional about improving your posture. Here are a few tips to get you started. First, examine your current posture by asking someone to take a picture of you from three different angles: front, back, and side. Look for the obvious signs of proper posture; your head and neck should be positioned over your body. Basically, you don’t want your forehead to be ahead of your chest, or your rear end to be sticking out behind you. See if you notice whether your hands hang evenly and if your hips are at the same level. You can use a free app like Posturezone to help you determine if your posture is correct. Always check in with your doctor or chiropractor before starting an exercise program. Alignment: Begin by standing up against a wall with your heels touching it and then take a step forward about the length of your foot. Next, lean back until your buttocks and back touch the wall. Push your head back (without tilting your chin up) until it is touching the wall. If you have trouble getting your head to touch the wall without tilting your head, simply push it back as far as you can while keeping it straight, then hold for 20 seconds. This helps strengthen your core muscles and trains them to support proper posture. Alignment in movement: Using an exercise ball, sit with your knees at a 90-degree angle and maintain your best, strong posture. Keep your knees, torso, and head still, and then very slowly move the ball in circles using your pelvis. Try three circles left, then three circles right. This can help you identify where you have neglected muscle fibers in your core. Balance: Stand in a doorway using good posture. Raise one leg, bending your knee until your thigh is parallel with the floor. Hold for 20 seconds. Repeat with the other leg. Do your best to avoid twisting or flailing your arms if you lose your balance. Instead, reach out for the wall to steady you. This exercise develops balance and symmetry of muscle control. If you choose the help of an upper cervical chiropractor, you may find exactly what you are looking for to relieve your neck headache. We are a unique niche of chiropractors who focus on the top bones of the spine. Misalignments in this area can lead to issues such as neck headaches and other headache types. The gentle method we use never requires popping or twisting the spine to get results. Instead, we encourage the bones to return to their proper position, and by doing so we provide a longer-lasting adjustment. Most of our patients and those in case studies come back with reports of significant improvements in their headache issues after only one or two adjustments. To schedule a complimentary Atlas Orthogonal consultation call 231-780-9900 or just click the button below. Jeffrey Zehr's Practice has been recognized as one of the top Norton Shores Chiropractic practices. What is Vertigo and What Can You Do About It? Vertigo in Children: What’s the Cause and What Can Help?